Real estate development is a multi-step process that can be complicated, lengthy and risky. It can take years to bring a project from the initial planning stage through construction to final completion, and there are plenty of obstacles that can pop up along the way. Yet development projects also can be highly profitable investment opportunities. By definition, development projects provide the opportunity to deliver a product that does not currently exist into a market, often providing the fresh new supply to satisfy pent up market demand. When executed well, this aspect of a development project can translate into a runaway success story, something that simply isn’t nearly as possible with an existing asset. Investors can more confidently assess some of the risks associated with construction by better understanding the “life cycle” of a development project. Two factors can play a big role in the risk of a given project: the project type and stage. 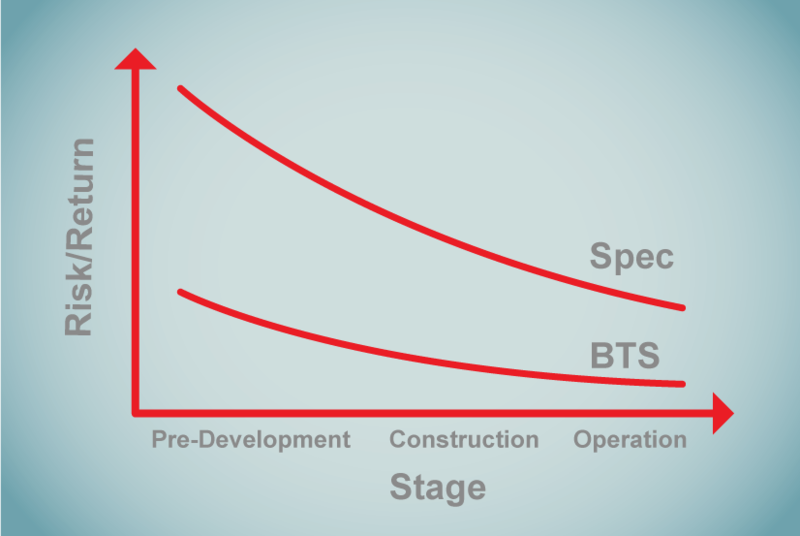 As shown in the graph above, the project type can determine the steepness of the risk curve across the project life cycle. An example of a project type with relatively low risk across all stages of the life cycle is a retail “build-to-suit” project. In a retail build-to-suit, a developer secures a long-term credit tenant, such as a McDonald’s or Walgreens, and develops a property to suit that tenant. For these types of projects, construction risk is low because the buildings are fairly uniform, and leasing risk is almost non-existent because the tenant is already identified and under lease with limited ability to terminate. There may be some pre-development risk depending upon the regulatory hurdles, as described in the Pre-Development section below. At the opposite end of the spectrum, an example project type with relatively high risk across all stages is called a “speculative” or “spec” project. In a spec industrial or office project, a developer may have few or no leasing commitments before commencing construction. The developer justifies the project by pointing to existing or projected demand for the property after completion. For speculative projects, the leasing risk is high because there are no identified tenants at the outset, the construction risk can be high if the project design is unique, and the pre-development risk can be high if financing is difficult to obtain or regulatory hurdles abound. As each step in a development project is completed, overall project risk incrementally abates. Early in the cycle there are more potential obstacles and unknowns. As a project nears the “shovel-ready” construction stage, many of those potential obstacles have been addressed and resolved and there is more certainty related to execution, costs and schedule. Below, we discuss items that are consistent across project types. Because this stage is the riskiest, pre-development work is usually financed by the project sponsorIn commercial real estate, the sponsor is an individual or company in charge of finding, acquiring and managing the real estate property on behalf of the partnership. The sponsor is usually expected to invest anywhere from 5-20% of the total required equity capital. They are then responsible for raising the remaining funds and acquiring and managing the investment property’s day-to-day... More or a source of seed equity that might get taken out by the construction loan. Investments made during this stage, therefore, provide for higher returns than those made during the later stages. One important note for equity investors is that obtaining construction financing from a bank or other lender is a very rigorous process, and if a developer already has a construction loan arranged, it usually means that a number of major hurdles have been cleared. Perhaps the greatest impediment to capital formation at this stage is the local jurisdiction permitting. There are usually two distinct approvals required to begin construction: land use approval and building approval. A land use permit is a governing jurisdiction’s approval of the project on a conceptual level. Almost every jurisdiction in the country, with the notable exception of Houston, Texas, has some form of land use regulation, which provides a subject system of sorting and qualifying not only the proposed use of land (retail, industrial, residential, etc.) but also the physical characteristics of the improvements (height, density, setbacks, etc.). By granting a building permit, a jurisdiction is approving a project on a technical level. A jurisdiction, through its engineers, will review building plans to determine whether they meet certain safety standards and conform to current building codes. The building permit application process is relatively speedy compared to the land use process because is supposed to be based on objective criteria. For this reason, it is less likely to delay fundraising. The building permit is generally the last milestone in the pre-development stage. The project typically is financed at this stage by the sponsor, outside investors, and a short-term construction loan. Often, the debt is distributed to the developer in increments called “draws” upon the achievement of construction milestones. Investments and loans made during this stage generally provide lower returns than pre-development investments but higher returns than those made for fully-constructed or stabilized buildings. The certificate of occupancy generally marks the end of the construction phase and allows for the commencement of property operations. Like the building permit, it is based upon objective criteria regarding construction quality and is a fairly administrative process. The project is typically financed at this stage with construction financing or another round of short-term “bridge” financing until the project reaches a threshold called “stabilization,” which is typically defined as a certain occupancy level (perhaps 90% or better) for a certain duration (perhaps three consecutive months). Upon stabilization, so-called “permanent” or long-term financing can be placed and used to take out construction financing. Depending upon the amount of pre-leasing that was accomplished during construction, this can be the least risky stage. For this reason, permanent loans and equity investments will provide the lowest returns. This snapshot view highlights the risk profile of development projects over time; however, many of the same risks applicable to the purchase or refinancing of an existing building, such as sponsor solvency and expertise, economic conditions, and market factors also apply. To learn more about online real estate investing and to register for a free commercial investing account, please JOIN NOW. Ian is a real estate professional and serial entrepreneur with over 19 years experience in real estate private equity, startups and equity and options trading. He has extensive experience in acquisitions, capital formation, directing teams, structuring deals, syndication, asset management, financial markets and investor relations.